Protect, preserve, promote, and support quality public library service in Nova Scotia. 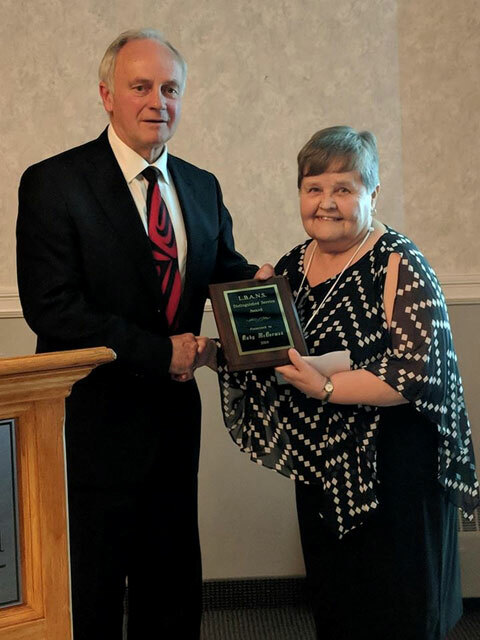 We are pleased to announce that at the LBANS/NSLA Conference this September 28-30 CEHPL Board Chair, Ruby McDorman, was recognized with the Library Board Association of Nova Scotia's 2018 Honorary Award. Here she is receiving the award from the Honourable Leo Glavine, Minister of Communities, Culture and Heritage. Ruby has actively served on the CEHPL Library Board for 16 years and counting. She has devoted countless hours to the Library, and has served in a leadership role on numerous Board sub-committees. Highly respected by library board and staff members alike, Ruby is known best for her integrity, warm personality and steady public advocacy for the value of public libraries in our communities. Public libraries in Nova Scotia play an important role in delivering a wide range of lifelong learning materials and services. We know because Nova Scotians, just like you, make over 3 million visits to public libraries a year. But we take public libraries for granted, that friend around the corner that is always there. The fact is that public libraries are supported by provincial, municipal, and community dollars. But the investment is well worth it. Public libraries employ over 800 professional staff in urban and rural parts of Nova Scotia. Public libraries are in 77 communities. There are also online libraries, mobile libraries, books by mail services, and satellite locations. The Library Boards Association of Nova Scotia needs you, as friend and user of public libraries, to speak up and say Public Libraries are important to me, my family, and my community. October is Library Month in Nova Scotia!